We've reviewed the best-known wedding insurance companies in the UK to help you understand the reasons for buying wedding insurance and what it costs. Click the insurer's name to get a quote. What are the options to insure a wedding? Does Tesco offer wedding insurance? John Lewis Finance offers six different levels of cancellation cover, from £10,000 to £100,000, with the dress, transport, cake and many other aspects of your big day covered as standard. Premiums start at £60 for the minimum cover and £310 for the maximum. Debenhams Wedding Insurance starts from £59.95, with five levels of cancellation cover ranging from £10,000 to £60,000 (the latter cover starts from £209.32). Debenhams' policies include cover for rings, transport, flowers, supplier failure up to £27,500 and wedding insurance abroad at no extra cost. If five levels of cover isn’t quite enough for you, E&L offers eight – with cancellation cover ranging from £3,000 to £50,000. Prices start at just £18.07 for the most basic cover and £175.44 for the top end option and there is an online saving of 35% and cover for weddings both in the UK and abroad. It is one to consider if you want to keep your costs down. You can get a quote at the E&L insurance website. We’re up to nine levels of cancellation cover now! From £2,500, starting at £19.44; to £65,000, starting at £210.35. Like the above options, cover includes rings, flowers, transport and the cake, with optional extras for marquee and ceremonial swords cover. Weddingplan insurance also boasts a Gold Trusted Service award 2017 from Feefo and were voted the Best Wedding Insurance Provider 2017 in the Smart Money People awards. 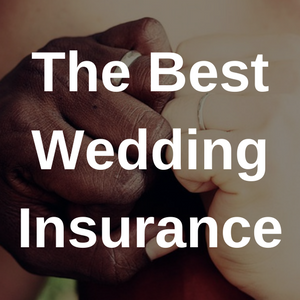 You can get a quote at the Weddingplan insurance website. Worry + Peace offers six levels of cover, ranging from £17.08 to £235.05. Its cancellation limits range from £2,500 to £50,000, with wedding gifts, transport, photographs, rings, flowers and cake covered as standard. You can get a quote at the Worry + Peace website. My Wedding offers four different wedding packages. Their cancellation cover ranges from £7,500 to £25,000. They cover transport, photographs, presents, rings and cakes, and offer a 35% online discount. If none of these are suitable for your big day, you also have the option to design your own wedding package tailored to your specific needs. You can get a quote at the My Wedding website. Insure For Weddings offers four levels of cover. Its cancellation cover ranges from £5,000 to £30,000 and starts from £22.99, with the most expensive policy starting at £87.99. Similarly to the other policies on our list, the company covers rings, flowers, gifts, photography and failure of suppliers as standard. You can get a quote at the Insure For website. Cover My Wedding offers four levels of cover, with cancellation cover ranging from £5,000 to £40,000. All its wedding insurance policies include cover for rings, flowers and cake, photography and wedding gifts, as well as ceremonial attire. You can get a quote at the Cover My Wedding website. Dreamsaver offers six levels of wedding insurance cover, ranging from Liability Only cover (which offers up to £5m public liability cover) to their Diamond policy with £30,000 cancellation cover. The company's policies cost from £25 to £104. Cancellation cover ranges from £6,000 to £30,000, and all policies apart from Liability Only include wedding gifts, rings, flowers, cake and photography cover. Wedinsure offers nine levels of cover, with prices ranging from £29 up to £195. Its lowest tier of cover offers £7,500 of cancellation cover, £5,500 rearrangement and £4,000 in supplier failure cover. Its highest level of cover offers up to £70,000 in cancellation cover, £52,500 in rearrangement and £40,000 supplier failure cover. Personal liability of £2m is offered as standard across all tier levels and also covers guest personal liability. They also offer the optional extras of marquee cover, personal liability extension to £5m and insurance for ceremonial swords. Rings, flowers, gifts and the cake are covered as standard, as is cover for your videos and photographs. Wedinsure boast the Feefo Gold Trusted Service award 2017 on their website. Get a quote from Wedinsure. Weddings are expensive – with things like the dress, flowers, catering and venue all adding up to thousands of pounds. In fact, the average spend for a wedding in the UK is over £27,000, though some spend several hundred times that amount. It is easy to get swept up in the excitement (and, let’s face it, sheer stress) of the planning and forget to think about whether such a large financial investment should be protected. And some venues and suppliers may insist you have wedding insurance before you book them. Tesco Bank does not offer wedding insurance. However, their home insurance policies Standard and Finest, offer up to £7,500 of "Increase in the total replacement value of contents for religious festivals, weddings, civil partnership ceremonies and births." You can read a review of Tesco's home insurance here. What are the options for my wedding insurance? Insure it as part of home insurance – some home insurance providers include some aspects of the wedding as standard in their policy, or at least allow you to extend the cover. However, it is very important to review exactly what is and isn’t covered – if extra cover is required, check whether adding this to your home policy is actually cheaper than getting separate cover. Stand-alone insurance – many companies, including house-hold names such as John Lewis Finance and Debenhams provide specialist Wedding Insurance. The specifications of the policy vary, depending on which provider and level of cover you choose, but should include the cancellation or postponement of the wedding due to illness, accident or a bereavement (within the main wedding party), or a supplier going out of business. Cover for particular items, such as the wedding outfits, rings and even presents is also included in most policies. Different policies will have different limits, and it is recommended to sit down and make a realistic list of what every item of your wedding costs (including how much you estimate the gifts will amount to) and take out a policy which offers sufficient cover. Some of the small print in wedding insurance policies might surprise you. Most of the companies on our list will cover you if your wedding is abroad. John Lewis Finance offers overseas cover as an optional extra, for instance, whereas Debenhams offers worldwide as standard. Bear in mind that if it is an optional extra, it may increase the price of your premium. Moreover, there may be some exclusions: Debenhams, for example, does not cover you for personal liability in the USA and Canada, and their optional marquee extension, ceremonial swords extension and public liability extension cover isn't available outside the UK. If you are planning on getting married outside of the UK, make sure you check the policy documents for the geographical limits of your cover to find out exactly what you are insured for outside the UK. No - it is up to you whether you would like to take out wedding insurance. However, some wedding venues do require it in order to accept your booking. Wedding insurance costs around £17 for basic cover and £300 for a comprehensive policy. For example, Worry + Peace charge around £17 for their cheapest policy while "Level 6" comprehensive wedding insurance cover from John Lewis FInance will cost £310. Websites such as MoneySupermarket and Which? can help you compare wedding insurance providers, including different wedding insurance reviews, to help you choose the right option for you. Whichever option you choose, it is vital you know exactly what is and isn’t covered both in terms of the different aspects of your day and in terms of cancellation. For example, most will cover the venue being destroyed due to fire or natural disaster, or a supplier going out of business, but not the theft of wedding outfits from a vehicle if they were not in a locked boot. Other unfortunate circumstances may also be left uncovered, but it's best to be prepared. The terms of cancellation cover vary as well, and so make sure to read the small print. In addition to the standard cover, you may want to consider honeymoon cover. Check to see if your provider offers this. If you have annual travel insurance, it is worth checking whether your honeymoon is already included in this, but, again, read the T&Cs carefully. Once you’ve chosen a company and bought a policy, make sure you know what to do in the event of a claim and, most importantly, carry on planning your perfect wedding day.